Home › Healthcare Reform › What’s the “Got to Have” toy this year? Socialism! It’s everywhere…and everyone wants it! It’s disappointing to see socialism spreading all over the world, but that is what it has come to. There are more people who want to be taken care of by other people than people who want to take care of themselves. It’s here in the U.S., in Greece, in France, in Britain…it’s all over the world. The only difference between the level of socialism in each location where it lives, is the pace in which it is taking over its new address. It didn’t work in Greece, but that didn’t stop France from electing a socialist President and turning their “Congress” entirely socialist. The previous President attempted to enact austerity measures and to reduce the size of government but that is not what people want. People want to be taken care of. Neither the government workers nor the French citizens who enjoy any type of government aid wanted to hear that their jobs were being cut or their pay would be reduced or their benefits curtailed. When the Socialists ran for President, it was easy to win…they simply promised they would take care of all of them and nobody would have to fear anything ever again. As the global market turns down again, and automakers begin feeling the pain, Peugeot struggles with laying off employees in France. What does the new socialist French President Francois Hollande do? He tells Peugeot they are not allowed to layoff any workers. It was that simple. A private company, that has nothing to do with the government, was simply told by the government that it is never to layoff a single worker. Period. Peugeot is a free market company with shareholders. It’s purpose is to make profits for the shareholders, so more people will be interested in buying shares, so the company can grow as those new shareholders invest in the company and create more profits, which as a side benefit, happens to also create jobs. Since the market is doing badly and Peugeot needs to scale back, they need to right-size their cost structure to meet the current reduced demand for their product and that includes layoffs. The French Government says no, the livelihoods of your current workers are more important than your profits, your share holders or even your company. And so it begins. The destruction. As the new French President takes control, through legislation, the workings of private enterprise in France, telling them what they can and can not do, the future is certain. Many companies will begin to abandon France en masse for fear of becoming the next target of French socialist control. The wealthy will flee and bring their money with them, which has already been reported in the news as countries like Britain report a substantial uptick in wealthy French families moving their money, and themselves, out of France. Why? Because France is going to raise the marginal tax rate for the wealthy to 75%. Would you stay anywhere that would take 75% of your paycheck? Well, neither will they. When businesses can no longer fire, they will respond by no longer hiring…it’s that simple. Since a business will not be permitted to adjust to the economy, then all companies in France that choose to remain, or must remain, will be frozen in time – neither growing or shrinking. To get ahead of this problem, many French companies will begin laying off employees before any legislation is created that prevents them from doing it so they can get ahead of the bullet. There will be a rising unemployment rate in France from both pre-emptive layoffs and corporate exodus. As French students graduate and start looking around for jobs, there will be none available as companies refuse to hire out of fear of being burdened by the new hires for all eternity. This will cause the unemployment rate to rise further. The government will become a primary source of job creation, hiring students to oversee a massive bureaucracy. To pay for this government expansion, taxes will have to go up on everyone. No new companies will invest by opening stores or businesses in France. The uncertainty that comes with a Socialist government, driven by the knowledge that such governments are continuously raising taxes and looking for new ways to redistribute profits will scare off any investment income that might have created new companies and the jobs that come with them. 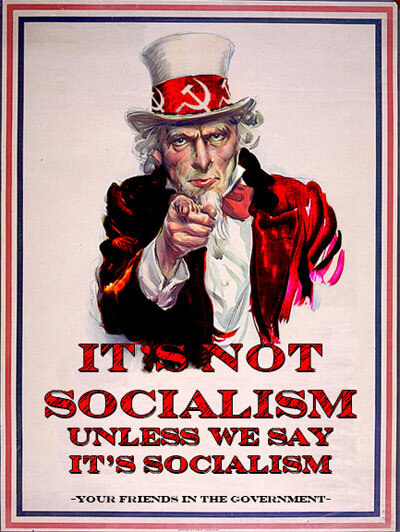 If socialism proceeds as it always has before, it leads to nationalization, and no company is going to risk setting up shop in France just to wake up one day and find out all of their assets have been seized by the French government. France is now the kryptonite to corporate investment. This will increase unemployment as no new companies appear to create new jobs. In order to take care of all of these unemployed, France will have to continue raising tax rates on the wealthy, on businesses and eventually on everyone who has a job, even those in the middle and lower classes. This will cause more people to leave and the French government will experience a steady decline in tax revenues while dependence on the government steadily goes up due to a declining economy and a lack of jobs. More people will need food, medical care, housing and money to live on. The “wealthy” which everyone including Obama continues to sell like snake oil to their citizens are always pitched as the solution to everything. Just take it from the wealthy and all our problems go away. The problem with that, which France will find out soon enough, and Greece already discovered, is that when you start to bleed the wealthy…they leave. And without the money they have which they invest in stocks and bonds of growing corporations that create jobs, only the leaches are left with no hosts to bleed. France will be fun to watch because we are on the same track, just further back on the train. Will watching France change America’s fate? No. Human behaviour can only be changed through experience. People will stop voting for universal healthcare and other socialist ideas when they personally are the ones waiting for two months in pain for a surgery that used to be available within a few days. But by then, it is much too late to change course. And the real tragedy? When the U.S. is no longer the “leader” in medical care, when all nations are on nationalized healthcare systems that are Government run then there will be nothing to point to as a reference that shows how badly government run healthcare is. In other words, once the politicians make sure the U.S. is brought down to the same inefficient and substandard care levels as all other government healthcare countries, how would anyone know the difference? Three generations from now, there will only be rumors that nobody believes that there was once a time when new medications and procedures and devices were improving and saving lives all the time and that people received medical attention in hours and days, not months and years. In the future we won’t be comparing the months of waiting time in Britain to the days of waiting time in the U.S. like we do now, we will be comparing the number of months we wait to the number of months everyone else in other countries waits and will celebrate our greatness if ours happens to be slightly less.